We celebrate the birth of children at Buck Run. It’s a good thing too because babies are everywhere! A couple time each year during our Worship Services, we publicly thank God for the gift of these precious little ones. Parents get to publicly affirm their commitment to raise their children to love and obey Jesus Christ while standing accountable before the congregation, as a witness of their dedication to parenting for God’s glory. As a people, we are always amazed at the good gifts of God. Few gifts are greater or more precious than the gift of children. If you would like to publicly celebrate your child on November 4, we invite you to join us. Please register using the form below. You will receive instructions concerning the morning of the worship service in which you have chosen to participate. 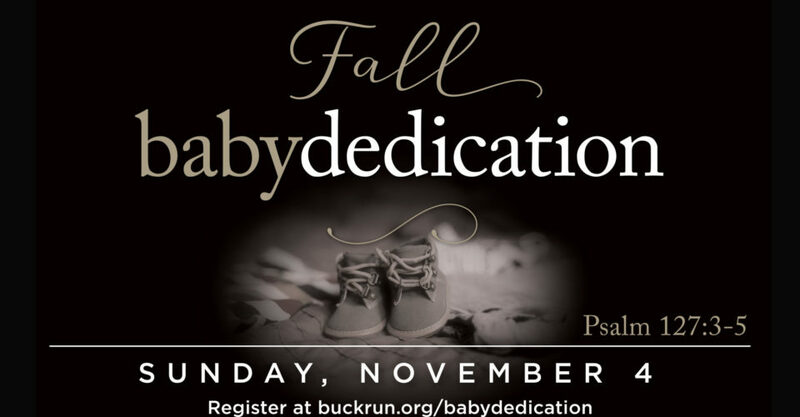 Register your family to participate in giving thanks to God for your children and publicly dedicating yourself to raising them for the glory of God.